AEON CO. (M) BHD. 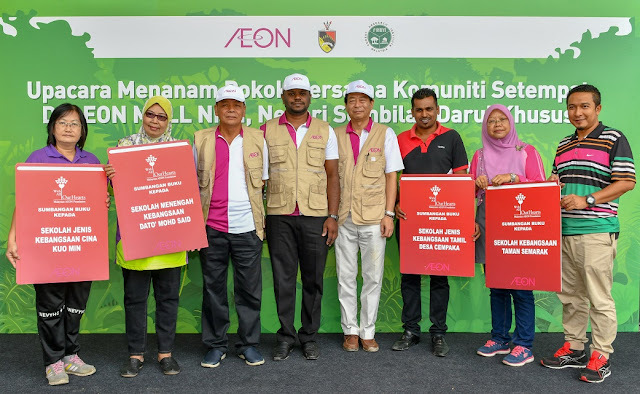 extended a helping hand to the environment in Nilai through AEON’s Hometown Forest Programme, with the involvement of around 800 volunteers from local residents, schools, government agencies and AEON representatives. The Hometown Forest Programme aims to highlight the importance of protecting and preserving nature while exposing environmental issues with the hopes of garnering local community support towards creating a cleaner and greener future. After a short brief by an official from the Forest Research Institute of Malaysia (FRIM), a total of 10,000 trees ranging over 83 different species were systematically planted on the grounds at AEON MALL Nilai. Saplings such as Shorea Ovalis, Kompasta Excelsa and Syzygium Gratum were amongst the species chosen for the trees, while shrubs such as Heliconia, Iris and Murayya were planted to beautify and create a nature-friendly ambiance. 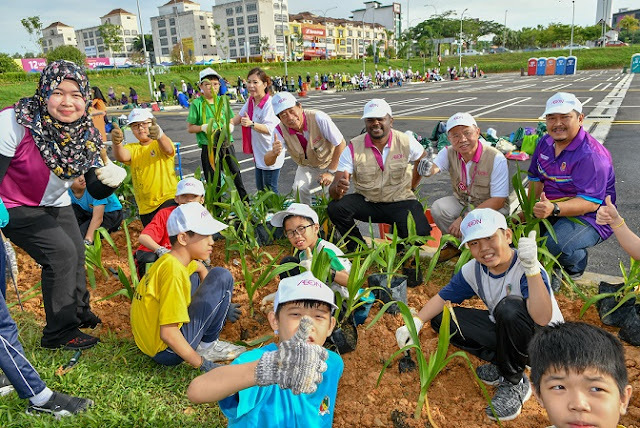 On top of that, medicinal species such as the Mahkota Dewa, Pandan and Lemongrass were also planted around the mall’s vicinity. This initiative is part of AEON CO. (M) BHD.’s corporate social responsibility programme that is always conducted together with the local community prior to the opening of any mall. The very first “AEON Hometown Forest Programme” was conducted in 1991 at AEON MALL Melaka. Since then, it has always been part of AEON tradition to plant trees on the grounds of AEON new stores. To-date, AEON CO. (M) BHD. has planted more than 500,000 trees within Malaysia over a period of 27 years and over 11 million trees on a global scale. The Hometown Forest Programme was officiated by Yang Berhormat Tuan Arul Kumar a/l Jambunathan, Chairman of the Action Committee for Human Resource, Plantation & Non-Islamic Affairs, EXCO & Nilai Assemblyman in the presence of Datuk Iskandar bin Sarudin, Chairman of AEON CO. (M) BHD. and Shinobu Washizawa, Managing Director of AEON CO. (M) BHD. They were accompanied by students from SK Taman Semarak, SK Salak Tinggi, SJKC Kuo Min, SJKT Nilai, SMK Dato’ Mohd Said; and AEON MALL Nilai management and staff. “This programme will always be one of the best ways to help the environment. Although the fruits of our labour will not be seen instantly, but in the years to come, we will be able to witness the visibility of our effort today. It is always a delight to see so many volunteers work together to serve the community here in Nilai,” concluded Washizawa. As a token of appreciation, the five schools that participated were each presented with RM5,000 worth of books, courtesy of Malaysian AEON Foundation.